Mainkai table lamp by Sebastian Herkner, $2,100 at Avenue Road. Sharp (2014) by Jessica Groome, $1,250 at Erin Stump Projects. Minna Cartographer Pillow, $275 at Souvenir. Bis Repetita placemats, $145 at Hermés. Bold Blooms vase, $28 (U.S.) at Anthropologie. Resembling lane dividers in a swimming pool or a length of fishing buoys, British designer Sebastian Herkner's LED lamp incorporates a marble base (in either Marron Emperador or Nero Marquina), powder coated steel and opaline glass. It's a sleek pick for the lighting collector on your list. Mainkai table lamp by Sebastian Herkner, $2,100 at Avenue Road. Art should never be selected for decor purposes, but it's hard not to imagine outfitting a creative living space by building on the bold forms and watery hues of Jessica Groome's acrylic on paper work, Sharp. The Vancouver-born artist exhibits out of Erin Stump Projects in Toronto. Sharp (2014) by Jessica Groome, $1,250 at Erin Stump Projects. 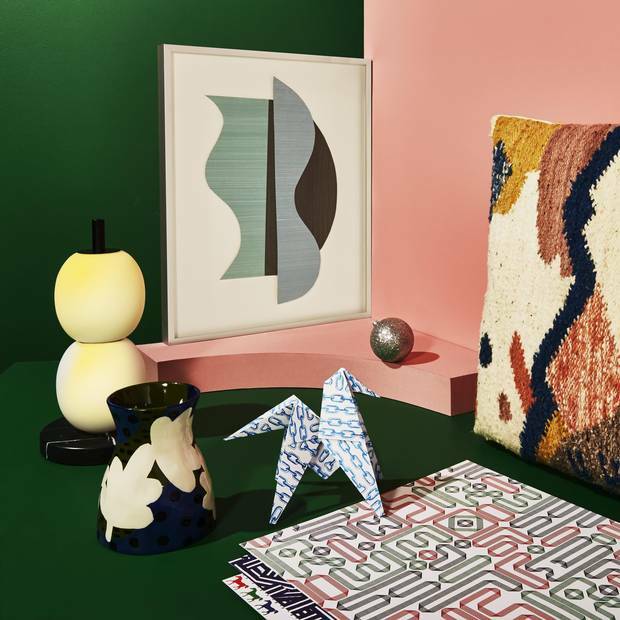 If there's one trend that's dominated the decor world this year (well, aside from millennial pink) it's the mash-up of textures in textiles, rugs and macrame-style tapestries. This pillow, by Brooklyn-based Minna, downsizes the aesthetic so it's easier to work into any design scheme. Minna Cartographer Pillow, $275 at Souvenir. Artist Gianpaolo Pagni interprets signature Hermès motifs including chains and horses into a series of 36 paper placemats. Use the 10-by-16-inch sheets to liven up a holiday dinner table, fold them to produce richly patterned origami ornaments or paste them up in a powder room to create a patchwork feature wall. Bis Repetita placemats, $145 at Hermés. The ceramic confections created by Julie Moon often resemble surrealist floral arangements and sculptural blobs. Her pieces for a collaboration with boho retailer Anthropologie are a bit more straightforward, emphasizing unique colour combos over peculiar forms. The partnership extends into the holiday season with a series of geometric ornaments in equally eye-popping hues. Bold Blooms vase, $28 (U.S.) at Anthropologie.